The Sunshine State has so much to offer in terms of beautiful weather, beaches, food from all over the world and amazing entertainment. It’s no wonder there is so much appeal to live in Florida, but it doesn’t stop there. Many industries are quickly picking up on the value to centralizing their ventures around Florida, but in particular; Miami, Broward and Palm Beach County. If you are looking to start a business, now is the time. 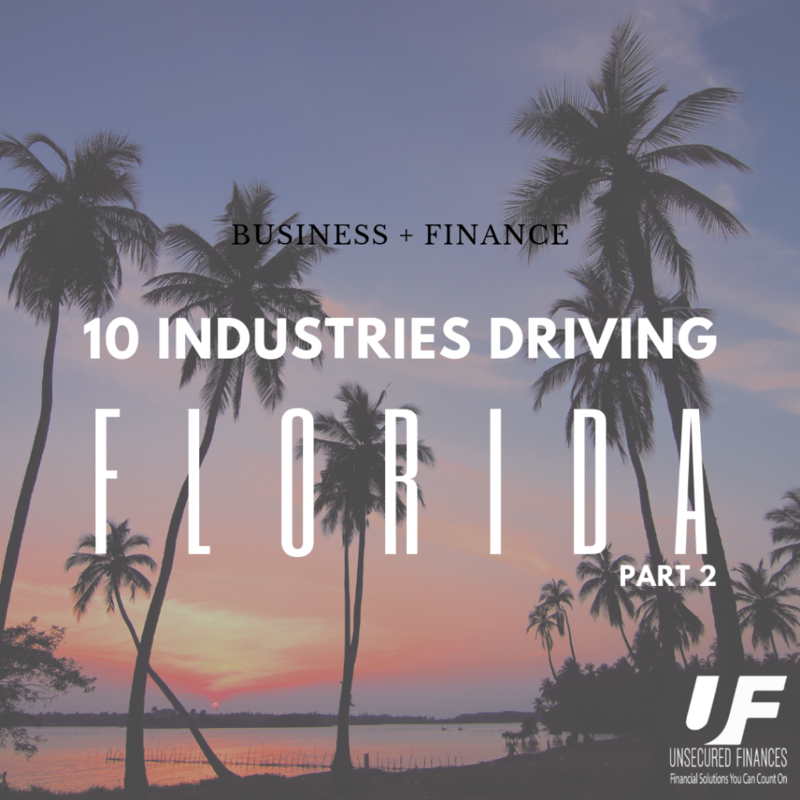 We took a look at several industries that are contributing highly to Florida’s economic growth, and our list continues! People have to get around, don’t they? Surprisingly enough, tourists aren’t the only ones looking at alternatives for transportation. Many Florida residents close to the downtown areas and beaches are opting for using transportation such as Uber, Lyft or even electric scooters! Recent reports show a climbing trend in Florida’s transportation infrastructure, especially with the top state in the nation. A continued strengthening in the economy has increased the need for multiple types of transportation services. Recent data shows a steady growth of a little over 1% in the last year. The professional services industry is making its mark in Florida, currently accounting for over ten percent of the state’s workforce. While there is certainly expansion across the state, Orlando is the nation’s leader in new job growth, with the professional industry seeing the most jobs created—more than 13,000 last year. The steady climb that began in 2013 is still moving upwards into 2018. These jobs include lawyers,advertising professionals, architects, accountants, financial advisers, engineers, and consultants, among others. In 2018, Investopedia listed Florida as the number 1 state to retire to. With all these snow birds and retirees, along with tourists and a large amount of people coming to the Sunshine State to contribute positively to their mental health, it’s no wonder why there is such a need for healthcare professionals. Florida’s booming healthcare industry aided the state in besting the U.S. in income growth in 2016. The industry was also the leader for state income growth at over five percent from the previous year. In 2015, the healthcare industry was responsible for over 900,000 new jobs and almost $130 billion in state revenue. With all the entertainment comes all the technology. Music festivals like the annual Ultra Music Festival in Miami bring in the most wild and bold professionals of the technology world to run a sea of light and audio equipment for some of the world’s biggest artists in the EDM scene. But it doesn’t stop there, music shows, festivals and clubs are always looking to bring on professionals who can run intricate equipment and create dynamic experiences. Florida has a rapidly expanding tech industry that has moved up to fourth place in the country in new job formations with over 12,000 new positions in 2017. Technology makes up 8% of Florida’s economy (almost $40 billion), including over $1 billion in venture funding for start-up businesses in burgeoning tech hub Miami. Oh, the food. With Florida being a well known melting pot of different cultures, people flock to South Florida to dine on a colorful array of cuisines. Higher end restaurants are constantly looking for staff to provide a tailored and professional experience to their guests, and new concepts open every day to compete for business. Florida’s food service industry is steadily on the rebound from Hurricanes Harvey and Irma that devastated areas in the state in 2017. While citrus farmers are reported the worst season in decades, Florida is still lead the country in restaurant sales during 2017. Additionally, Miami is seeing steady growth with a new restaurant trend—food halls—that melds the concept of food courts with a fine dining experience.